In the previous post I've discussed how not to hack Facebook. Here we will discuss how to hack Facebook. This tutorial is meant for enhancing you networking skills, as well as to develop understanding of how fake web pages are created, so that you can protect yourself from such attacks. Don't use this information to hack someone's account, or you'll run the risk of getting into legal troubles. If you haven't yet read the previous post, you should. It might not be very enlightening in terms of technical details, but it quite enjoyable and will provide you with a background of what we are looking at. The Social-Engineer Toolkit (SET) was created and written by the founder of TrustedSec. It is an open-source Python-driven tool aimed at penetration testing around Social-Engineering. SET has been presented at large-scale conferences including Blackhat, DerbyCon, Defcon, and ShmooCon. With over two million downloads, SET is the standard for social-engineering penetration tests and supported heavily within the security community. Start Kali Linux. In a console/terminal type se-toolkit. stop shop for all of your social-engineering needs. Now type the following and press enter. The 2 selects Website Attack Vectors. Not that obvious. The Web Attack module is a unique way of utilizing multiple web-based attacks in order to compromise the intended victim. Then, the 3 selects Credential Harvestor. The Credential Harvester method will utilize web cloning of a web-site that has a username and password field and harvest all the information posted to the website. Type 2 to select site cloner. Now it'll ask you to specify the IP to which the data is supposed to be sent to. That'll be your IP address. Since this is your internal IP address (i.e. local IP), the fake facebook page will work only for computers connected with your LAN. Now it'll ask for the page to be cloned. Enter https://www.facebook.com/. Now in your browser on Kali Linux, enter your IP. 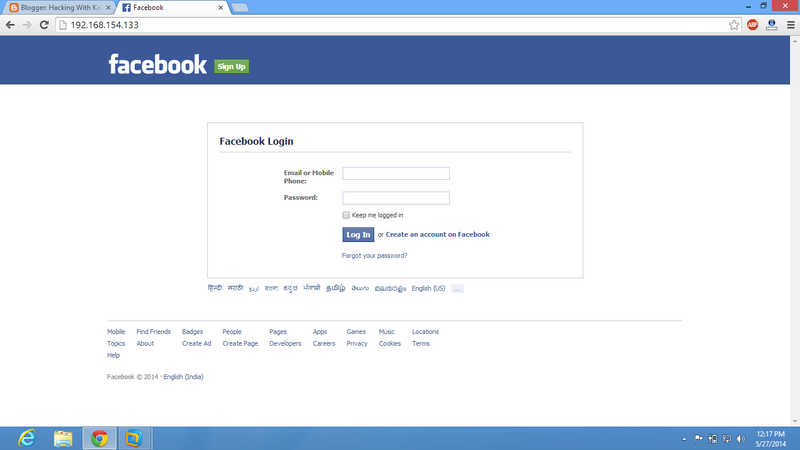 It will display facebook login page. Enter any info and press login. You will get the information in se-toolkit. If you are using VMWare or virtualbox, then you can try and enter the IP on the browsers there. It will work. To make sure that the demonstration is not just a repetition of what you already know, I have decided to clone the login page of facebook, instead of homepage. It will be a tad bit different. Here is a screenshot of what I did. The IP address is my internal address from ifconfig, which comes out to be 192.168.154.133. The cloned page is https://www.facebook.com/login.php. Now we will try to see if this credential harvestor works. Also note that se-toolkit might keeping dumping more stuff in the console, most of which is not important for the time being. Now I'm running Kali on a virtual machine. Windows 8 is the host machine, and we might want to check if it works on Windows 8. Also, we would also like to see if modern browsers are able to observe anything wrong with the page, and if the firewall stops the data flow. I entered windows8host and password2 and pressed the login button. This is what I got. Also, as I was logged in to Facebook with my personal account, the fake page redirected me to facebook. Conclusion : This method pretty much works well over LAN. Thats the file where SET saves all captured credentials. that happends in new versions of kali. when i try to acccess the fake website it says "unable to connect" please help me someone. Did you figure it out? Can you elaborate on the problem? hi on backtrack linux was cd /pentest/ heere all the tools / but in kali linx how was ?? users on my network can access the fake page. User outside my network can not access the page using my IP wan. you need to port forward your router and use your internet ip in setoolkit. says use apache server like something...asks to starting using Apache server ? Your going to have to enable Apache because that is what it uses to Clone the site, this is often a prompt which is established by the program upon running it for the first time. this should cause the site cloning to work. Hey there I have an issue regarding an android payload, when I open the apk file on the phone , and have msfconsole open and ready, after opening the apk there is no communication/sessions? I tried port triggering the lports i used but nothing... What do you think is going on? nothing gets printed in my harvest text file...what is the issue?? For a better experience on Facebook, switch to our basic site or update your browser.this is the problem when i enter my ip in the url. and also when i enter username and password those data are not get loaded into the harvest_date.txt file. can you help me out of this???? after doing the steps to copying ip to the browser, after that it shows up nothing? Need some little advice. . . . I got it. You need to move the copied files into html file. How would one go about sanitation of the attack system after conducting the attack? Launcher.hta keeps dropping back into the /var/www/html directory. most people use facebook app to login to their account, so therefore this kind of attack maynot be of use. Is it possible to capture the data that the cellphone is exchanging with the server to actually decode a username and the password? Capturing the data isn't all that hard. Wireshark in promiscuous mode will do that for you. Airodump-ng too. The problem is that the data is encrypted with a very strong cipher (AES 128 bits I think), which we can't decode. I followed the process and everything went right but at last when im entering my ip in my browser it show - PROBLEM LOADING THIS PAGE...Wat to do?? that is a great tutorial thanks for sharing it. There are a lot of employees which are hired in order to increase the work force in electric energy and power engineering industry. I send the ip to my friend and told him to tell me what he see there.He said it's just loading and not showing any pages. I send the ip to a victim and can't wait whole the day long with my pc on. Is there a way where i can see all the hits whenever i came back to my pc? [*] Error. Unable to clone this specific site. Check your internet connection. You may need to copy /var/www/* into /var/www/html depending on where your directory structure is.